After nearly two decades in Britain, Bill Bryson, the acclaimed author of such best-sellers as The Mother Tongue and Made in America, decided it was time to move back to the United States for a while. This was partly to let his wife and kids experience life in Bryson's homeland - and partly because he had read that 3.7 million Americans believed that they had been abducted by aliens at one time or another. It was thus clear to him that his people needed him. But before leaving his much-loved home in North Yorkshire, Bryson insisted on taking one last trip around Britain, a sort of valedictory tour of the green and kindly island that had so long been his home. His aim was to take stock of modern-day Britain, and to analyze what he loved so much about a country that had produced Marmite, zebra crossings, and place names like Farleigh Wallop, Titsey, and Shellow Bowells. With characteristic wit and irreverence, Bill Bryson presents the ludicrous and the endearing in equal measure. The result is a hilarious social commentary that conveys the true glory of Britain. 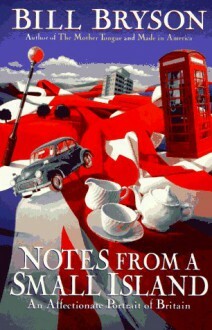 An enjoyable romp around England from an Americans perspective.The author has lived here for a while, and was due to return to the States so went on one last tour around.Laugh out loud funny in places, in others he can belabour a point, but overall a good read.